AMES, Iowa -- An international team of astronomers that includes Steve Kawaler of Iowa State University has announced the first discovery of a planet orbiting a star near the end of its life. The announcement, culminating seven years of research, will be published in the Sept. 13 issue of the journal Nature. 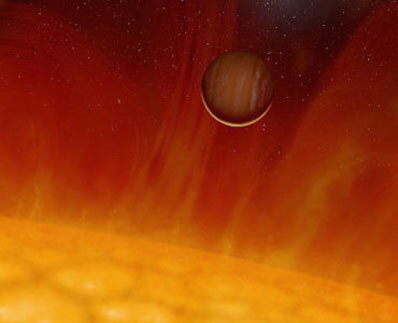 This artist's concept represents planet "V 391 Pegasi b" as it survives the red giant expansion of its dying sun. Courtesy of HELAS, the European Helio- and Asteroseismology Network. The news provides a preliminary picture of what could be the Earth's destiny in four to five billion years. That's when the sun will exhaust its hydrogen fuel, expand enormously as a red giant and expel its outer layers in an explosive helium flash. The planet discovered by the researchers, "V 391 Pegasi b," has survived all those changes to its sun. The international research team was led by Roberto Silvotti from the INAF-Osservatorio Astronomico di Capodimonte in Naples, Italy. They discovered the planet orbiting "V 391 Pegasi," a faint star in the constellation of Pegasus. "The exciting thing about finding a planet around this star is that it indicates that planetary systems can survive the giant phase and the helium flash of their parent star," said Kawaler, an Iowa State professor of physics and astronomy. "It bodes well for the survival of our own Earth in the distant future. Before V 391 Pegasi lost its outer regions at the helium flash, the planet orbited the star at about the same distance that the Earth orbits our sun." But, Kawaler said, "We shouldn't take too much heart in this -- this planet is larger than Jupiter, so a smaller planet like the Earth could still be vulnerable." Kawaler helped the 23-member research team make its discovery by coordinating observations during a 2003 run of the Whole Earth Telescope. Iowa State is a lead institution in the Whole Earth Telescope, a worldwide network of cooperating observatories that allow astronomers to take uninterrupted measurements of variable stars that change in brightness. The discovery of V 391 Pegasi b was made by detailed measurements of the clocklike variation of the star caused by the planet tugging on it. Kawaler also advanced the project by doing theoretical calculations to make sure irregularities of the star's orbital motion were caused by the orbiting planet. The astronomers found that at the present time, V 391 Pegasi b has an orbital distance 1.7 times the medium distance between the Earth and the sun. As stars age and reach their red giant phase, they undergo an enormous expansion (with their volume increasing by a factor of millions) that can easily reach and engulf their inner planets. "The same will happen to the sun," Silvotti said. "As far as our planets are concerned, we expect Mercury and Venus to disappear in the sun's envelope, whereas Mars should survive. The fate of the Earth is less clear because its position is really at the limit: it appears more likely that the Earth will not survive the red giant expansion of the sun either, but it is not for sure." As is the case for almost all planets beyond our solar system, V 391 Pegasi b cannot be seen directly. Silvotti said it took seven years of observations and calculations to confirm the existence of the planet.